PARK CITY, Utah (Reuters) - Robert Redford chafes at the descent of what he calls "ambush marketers" on the celebrities attending the Sundance Film Festival he founded as a showcase for independent film without all the commercial trappings of Hollywood. But he may be encouraged by the latest trends in so-called "swag" on the sidelines of this year's event. Celebrity gift baskets, a phenomenon driven by companies' hopes that celebrities will be shown using their products, are becoming lighter and greener and just a bit more discreet. Stars at Sundance also have more opportunities to make donations to charity, from underwear for a local women's shelter to phone cards for soldiers. And who is playing the leading role in this new version of swag? None other than the tax man. Last year, months before the Academy Awards, the Internal Revenue Service launched a swag crackdown, putting Hollywood on notice that the $100,000 goodie bags for Oscar participants -- stuffed with Hawaiian hotel suites and surfing lessons -- were not gifts but rather compensation and subject to taxes. "The rule has always remained the same -- people have to pay their taxes. But the awareness of it, that has changed," said Karen Wood, founder of the Backstage Creations Gift Retreat, set up this year on Park City's Main Street. At the opening news conference for the festival, which runs until Sunday, Redford noted the rise in celebrity giveaways, which have become pervasive in Hollywood, and said they were inevitable here given Sundance's growth. Celebrities can collect gifts at events that take place outside the official festival. On a bustling Main Street, leading stars and lesser ones go from lounge to lounge loading up bags. Wood assigned a tax adviser to her event at the recent Golden Globe Awards and has also moved to increase the charity presence to reduce the gift-bag tax burden. "They can shop and have a great time in here, and any of the items they would like to donate to the charity, they can," Wood said. The philanthropic option also was adopted at a dinner following the screening of "Grace is Gone," a film about a man whose wife is killed in the Iraq war. In lieu of gift bags, attendees were told $10,000 worth of prepaid phone cards were donated to U.S. military personnel overseas. At the beginning of the year with new budgets ripe for spending, companies see Sundance as a key opportunity to get their products into celebrity hands. The snowy charm of the Park City ski resort provides an ideal background for photos of stars and their products. Kari Feinstein, who has been running gift lounges at Sundance for seven years, said there are fewer big-ticket items like computers or jewellery this year because companies have to notify the IRS about giveaway items worth more than $600. But in her lounge, a stand offering Apple laptops with a declared value of $1,099 and iPods was the rage. As actor William Baldwin came around the corner, he was ambushed by the marketers. 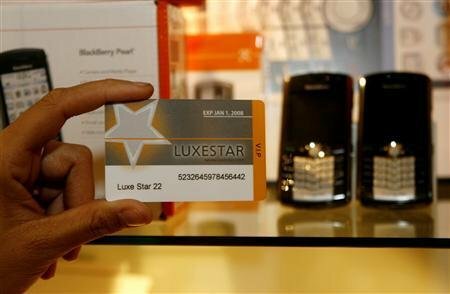 A new company, Luxestar, allows Sundance luminaries take a more discreet approach by giving them a computerized gift card -- the value depending on their level of celebrity -- and choosing their gifts off a Web site over the course of a year. Deliveries are made to the star's home or office, and the general public can track what celebrities are buying online. No celebrity event these days would be complete without "green" options to cater to the growing group of eco-conscious Hollywood stars emulating the likes of Leonardo DiCaprio. Nicole Landers has set up the Ultimate Green Room on Main Street, where she gives VIPs exposure to organic, sustainable products, from cosmetics to coffee. "This is not just a trend, but a permanent part of Sundance, these eco-friendly, responsible lounges," said Eric Schnell, co-founder of Steaz, maker of organic green tea soda and energy drinks.